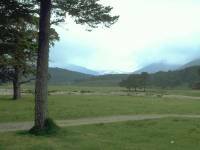 June 2000, and I'm spending a week in Braemar. 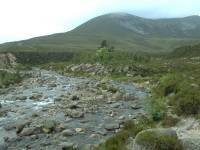 The aim is to climb as many Munros as I can during the week, dependent on weather conditions. After a successful tour of the Glas Maol group on Sunday, and a complete wash-out on Monday, I've decided to head down Glen Lui on Tuesday. No real aim in mind - just climb something in the available time. The weather is bright but rather cloudy and the prospects for the tops don't look good. But I've never been along Glen Lui before. 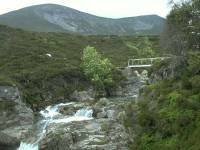 It's the gateway to the Cairngorms from the south and should at least provide a good valley walk. 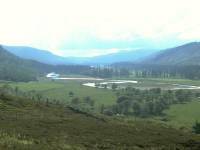 With no transport, I've set off from Braemar on foot. 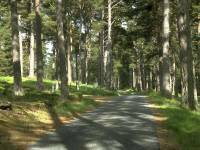 It's six miles along the road to Linn of Dee, where the road crosses the Dee and curves back along the north side and Glen Lui heads off northwestwards to Derry Lodge. 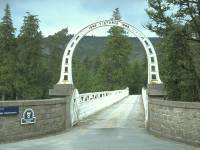 The Victoria Bridge, seen here, is the first bridge over the Dee west of Braemar and provides a useful shortcut. 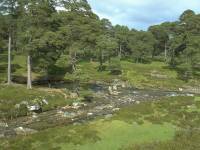 Victoria Bridge gives pedestrian and cycle access to the grounds of Mar Lodge, once the hub of the local estate but now owned by the National Trust for Scotland. 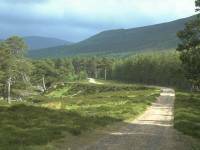 Beyond Mar Lodge I've taken another shortcut, along this vehicle track over the shoulder of Doire Braghad. 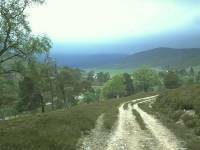 The track merges with the estate track in Glen Lui. 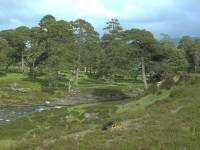 The weather has been too poor to take any photos along Glen Lui and I've now arrived at Derry Lodge, about three miles from Linn of Dee and eight miles from Braemar. Derry Lodge (not pictured) appears to be an old hunting lodge and, though it's in good repair, is empty and boarded up. There are a couple of outhouses nearby - one with a public phone - and across the river is a keepers' cottage. The landscape of open woodland and grassland is lovely, even under dull skies. Wild camping is allowed (or at least tolerated) here and there were plenty of tents around. 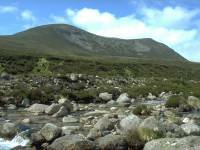 After weighing up the prospects I abandon a climb of the nearest Munro, Beinn Bhreac, and head along Glen Luibeg. 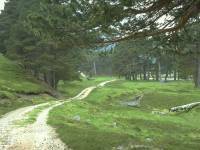 For a couple of hundred yards the track becomes sketchy as it traverses wet ground. 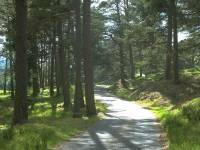 The track along Glen Luibeg, through primeval Caledonian forest. Pictured is one of the better stretches; it's rather rougher than this on average. 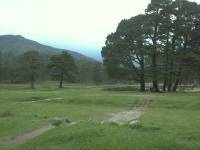 Cyclists are discouraged from Glen Luibeg and to be honest the terrain is difficult for bikes anyway. I'm starting to think that I should consider hiring a bike. It's already gone midday and effectively I've not actually got anywhere yet. Glen Luibeg, still under cloud cover. The slopes of Carn a Mhaim, a southern outlier of Ben Macdui, come into view two miles west of Derry Lodge. 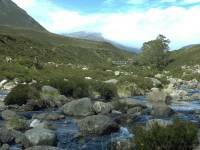 The glen turns north here and leads up into the wild country between Ben Macdui and Derry Cairngorm, ultimately leading to the Coire Sputan Dearg. It's supposed to be possible to ford the Luibeg burn here but I didn't like the look of the stream. An accident, a sprained ankle and a drenching would have been all too easy. Fortunately there's the Luibeg Bridge just upstream. 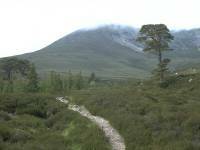 From here the path crosses the shoulder of the Carn a Mhaim and then descends into upper Glen Dee at Corrour bothy, the southern end of the Lairig Ghru. 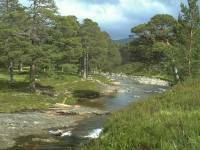 Unfortunately it's now 1.30 pm and I'm more than four hours' walk out of Braemar; reluctantly I shall have to have lunch here and then turn back. No Munros today. The weather wouldn't have made a climb worthwhile anyway. I meet a crowd of venture scouts, nearly all girls, at Luibeg Bridge. They're all carrying really heavy backpacks. 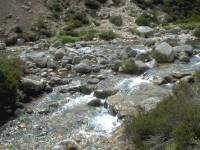 They camped the previous night at the Fords of Avon and are heading for White Bridge tonight. Lovely country to be in but I don't envy them carrying those packs. I find a quiet spot for lunch and suddenly the cloud lifts from the nearby Carn a Mhaim. Plenty of cloud in upper Glen Luibeg still, but it's thinning as I watch. 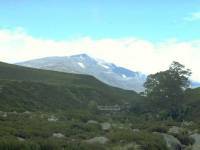 Beinn Macdui, Scotland's second highest mountain, appeared briefly. But it soon vanished again and the murk returned. 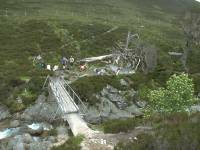 That brief clearance at Luibeg Bridge made the day worthwhile but I now had to return to Braemar, which I wouldn't reach until early evening. I was nearly back at Linn of Dee when the second clearance in the weather arrived. This shelf above the river makes a lovely picnic spot and I had afternoon tea here. 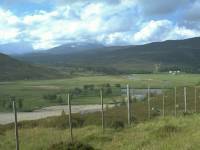 Looking north along the Lui river from Linn of Dee. 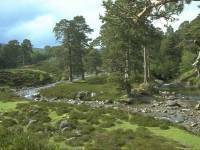 Primeval Caledonian forest at Linn of Dee. Another view of the Lui. Just south of here the Lui merges with the Dee. 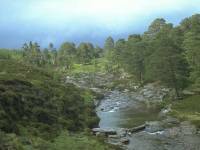 A riverside scene just before the Glen Lui track reaches the road. 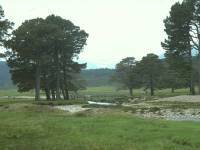 The access track to Mar Lodge from the road on the north side of the Dee. 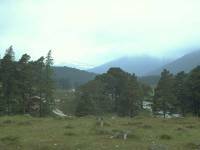 Woodlands northwest of Mar Lodge. 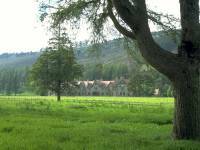 Mar Lodge itself, seen from the south access drive. The sun has disappeared (and wasn't to reappear for the rest of the week)..
A bright, though not sunny, interval allowed me to grab this shot of the upper Dee valley from the road back to Braemar. 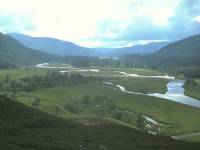 Strath Dee in the Braemar direction. 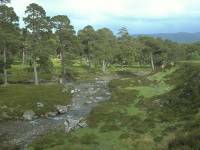 A last look back towards Linn of Dee as evening approaches. The remainder of the week was entirely unsuccessful and I gave up on the Thursday morning and returned home early.